With the new Star Wars movie setting attendance records, Star Wars toys are popular gifts during this holiday season. 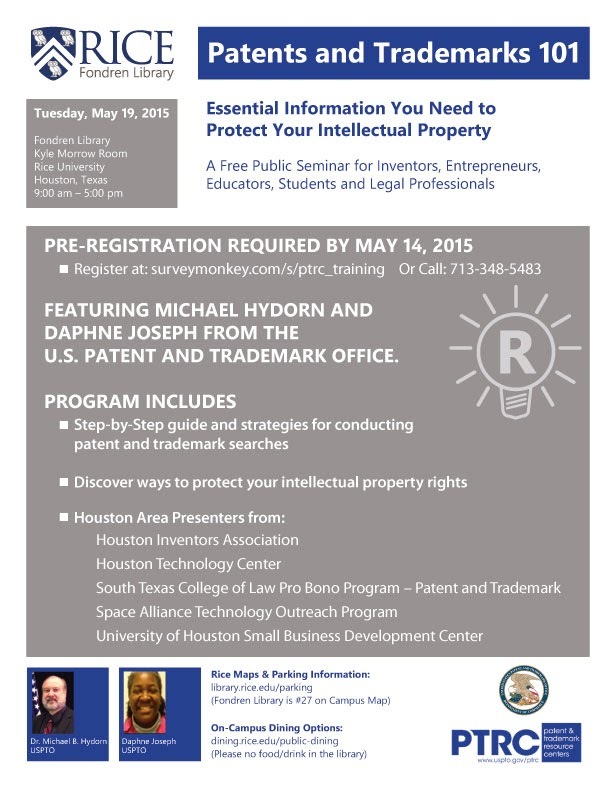 As to be expected, patent and trademark protection was sought when they were created. A sampling of design patents include Boba Fett (D264109), Yoda (D265754), Hoth Stormtrooper (D265332) and Jabba the Hutt (D277211) to name a few. Trademarks range from film names like the Empire Strikes Back to character names like Luke Skywalker now even used on wine products (Skywalker Vineyards). The National Inventors Hall of Fame has announced the 2016 National Inventors Hall of Fame inductees, a diverse group of living and deceased groundbreaking scientists whose inventions have made a tangible impact on society. The winners will be formally inducted on May 5, 2016 at the Smithsonian American Art Museum and the National Portrait Gallery. More information is available from http://invent.org/inductees/ or from a CBS news story. marks. These rule changes codify current USPTO practice set forth in the USPTO's ``Trademark Manual of Examining Procedure'' (``TMEP'') and precedential case law. These changes also permit the USPTO to provide the public more detailed guidance regarding registering and maintaining registrations for these types of marks and promote the efficient and consistent processing of such marks. Further, the USPTO is amending several rules beyond those related to collective marks and certification marks to create consistency with rule changes regarding such marks and to streamline the rules, by consolidating text and incorporating headings, for easier use. DATES: This rule is effective on July 11, 2015. FOR FURTHER INFORMATION CONTACT: Cynthia Lynch, Office of the Deputy Commissioner for Trademark Examination Policy, at (571) 272-8742 or tmpolicy@uspto.gov. 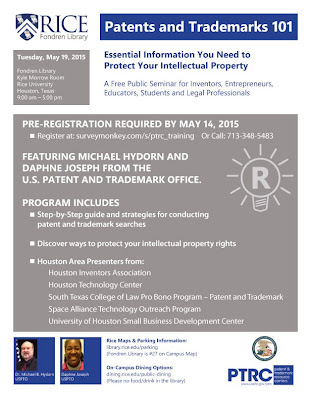 See Patents and Trademarks 101 (http://library.rice.edu/events/patents-and-trademarks-101) for more information about this free patent and trademark searching training from the USPTO on Tuesday, May 19, from 9:00 am - 5:00 pm.